Many people like the flavor of raspberries but can’t stand the raspberry seeds and hulls. To produce a seedless jam requires an additional step to the usual jam making process. 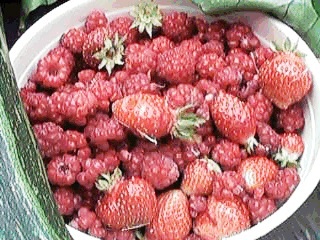 The berries are processed through a strainer. The seeds are separated and the resulting puree is used to make the seedless jam. The resulting jam is good for more than just the morning toast. It is a world class topping for cheesecake, ice cream and as a sweet glaze for oven roasted meats like pork roast. Make raspberry puree: Requires the use of a fruit strainer. There are two that I am aware of. There is the Sauce Master Food Strainer with the optional fruit and berry strainer, and there is the Kitchen Aid strainer attachment. Either will work although the Kitchen Aid screen is a bit coarse. Process the berries through the strainer and collect the puree. Catch the discarded seed and hulls in a bowl. Once you have processed all of the fruit through the strainer, process the discard through the strainer. The discard will push through any berried remaining in the strainer from the first processing. Also, there is still a lot of juice and puree in the discard that can be recovered. After second processing, dispose of seeds and hulls. Measure out 4 cups of the raspberry puree. Any extra puree can be saved, properly packaged, in the freezer. Add the puree to the jam making kettle. Use either a copper or non-reactive pan, either Pyrex, stainless steel or enamelware. Use a large enough pot. The sugar and raspberry mixture should only fill the pot one-forth full - the boiling sugar and puree mixture will foam and the volume will expand many times - keep stirring! Add sugar and lemon juice to the raspberry puree. Heat over high heat while stirring constantly. Bring to a boil. Reduce heat and simmer for 5 minutes while stirring constantly. Skim off any foam and discard. Return to high heat. When mixture returns to a rolling boil, add the liquid pectin. Stir constantly. When mixture returns to a boil, boil for 1 additional minute then remove from heat. Continue to stir until all bubbles are gone. Skim any foam or film from the surface and discard. Jam is now ready to bottle following approved methods. After bottling, process in hot water bath for 5 minutes.